I’ve had this post in the pipeline for weeks now! I find fragrances kind of hard to write about and also kind of hard to read about! There’s only so many times I can read what the ‘top note’ is with the underlying hint of whimsical whatevers…. You really can never judge a fragrance until your wrap your own nostrils around it. Saying that though, let’s throw hypocrisy to the wind and have a look at some fragrances. I’ll even try and write about them in a way that makes sense to people who have no idea what fragrances depict what flower and the like. I shall sniff my way through and try and describe them in the best way I can. But if all else fails just pop along to your local Boots and have a whiff yerself! It’s probably not going to make much sense…. Korres Vanilla, Freesia, Lychee EDT – I LOVE this fragrance, it’s definitely now *my* scent. It’s one of those that when you read the description you think it would smell quite sickly and fruity, but it’s a really creamy and mature scent which lasts forever, the vanilla is light with the freesia not being overly flora, it’s a really lovely and unique mix of scents. I recently finished my first bottle of this and cracked open another straight away, the scent lasts all day so you only need a spritz to keep you going. It’s also great value for money at around £25 for a 50ml bottle!! If you ever want to buy me a perfume, buy me this one. It’s one that always gets picked up on from people asking what it is, even hours after I’ve sprayed it on! This would be a good gift for any ladies in your life as I’ve yet to find someone who doesn’t like the smell! Gucci Flora Gorgeous Gardenia – This is a very sweet at first scent which settles in to a lovely floral smell. I will admit that when I first spray this on it’s a little *too* sickly sweet for me, but after 10 minutes or so it smells of the most lovely and uplifting floral fragrance I ever did smell. With a hint of patchouli (which is one of my favourite scents) it’s a lovely warm scent. The bottle is also so pretty! Perfect gift for a lady in their early 20’s I would say, as it’s such a fun floral fragrance. The Body Shop Love Etc…. – Excuse the battered bottle for this one! I’ve had it since the summer and as you can see it’s running a little low. Once again a lovely uplifting, sweet and floral scent. It’s kind of like a mix of the aforementioned two. I’ve steered clear of Body Shop scents for years as the underlying smell of musk in past fragrances I’ve tried is another smell that triggers migraines for me. This however, stays true to the first spritz and smells like jasmine, vanilla and sandalwood. Like the Korres fragrance, it’s more of a authentic vanilla smell not the artificial type you’d find more in a cake or something, and once again perfect for a summer scent and is more of a ‘younger’ scent. The Body Shop Shea EDT – Another Body Shop fragrance which I absolutely adore. This is such a lovely rich and creamy nutty scent which really makes you warm inside!! Seriously. They do a load of these little bottles in different scents and I also have a grapefruit one. These are a more fun fragrances for a more mature nose and come in a great range. They’re affordable too and you can buy more products in the same scent to make a nice little gift basket or something! Yves Rocher Neroli Secrets D’essences – This comes in such a lovely bottle, it’s perfect for placing on the dresser. A great gift for your mum too! The scent is a little bit sharp at first but settles down to a lovely subtle zest, with a hint of orange blossom and soft neroli fragrance. And as a brucey bonus, if you purchase the perfume you also get a free shower gel, see here. I didn’t even realise Yves Rocher did fragrances, but they have an awesome range of natural, floral and fruity scents to have a smell of. Finally we have the scents aimed more for the teenage nostril. The Hello Kitty Star perfume I picked up from Marks & Spencers last year on sale. It’s a nice, refreshing smell which I wear usually for work. It’s kind of a typical non de-script but pleasant smell, a cheeky bit of vanilla again with a very delicate floral. Oriflame Sparkle in Paris I just had to have for the Kanye West vibes haha. My dad smelt this and said ‘Yeah, smells like perfume, it’s alright’ …..Which is pretty bang on actually! It reminds me a bit of Charlie perfumes (remember them?) but not as cheap and tacky smelling. This is a nice ‘almost a grown up, but not quite’ scent. Does that make sense? I hope so! And the same goes for the So…? In Love perfume too. A scent very much aimed at teenagers but a little more edgy in a non patronising way. Have you had a whiff of any of these? Does this blog post make sense? 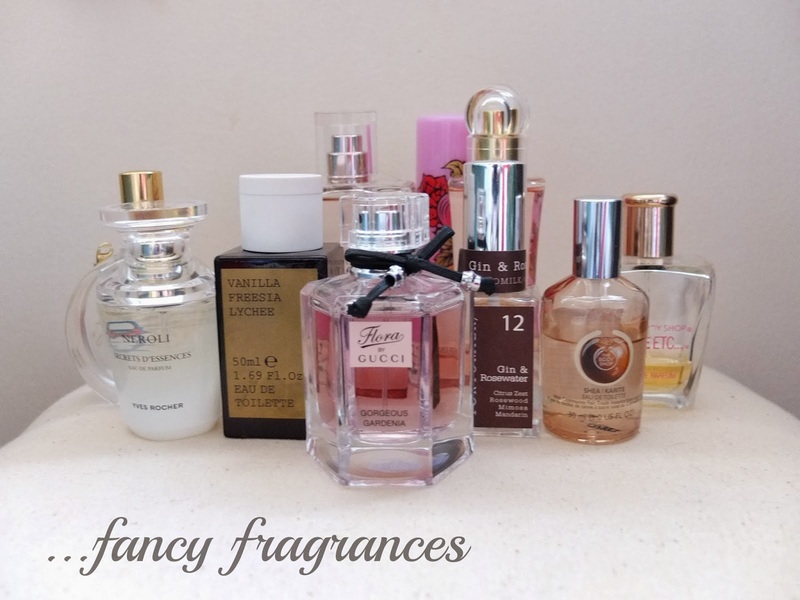 Are you hoarding fragrances like I am? Next Post I’m In The 212….